Title: How I Suicided not. Genre: Biographies & Memoirs, Contemporary, Fiction, Contemporary and Literature & Fiction, Literature, Memoirs, Biography, Biographies,. I would tell people that you should step outside your comfort zone with books because it is good to add more authors and genres to your reading portfolio even if you do not read book like this. This book has 210 pages and 7 chapters in it. Book Dedication: For M., my soulmate and the love of my life, to my sisters, to our families and friends, including my sisters who mean the world to me, and especially to the one I have known all my life who has been my friend and confidante. I dedicate the song by Francis Cabrel, Je T'aimais, Je T'aime, Et Je T'aimerai which means I have loved you, I love you, and I will always love you. For my special sibling who will remain nameless because of privacy reasons, she has always offered encouragement and support and been my cheering section. I do not know how I would have made it with her R, O, C, and E,. his daughter Katy, a friend who died of suicide, M's kind family and friends who have been great, who first along with M saw this book and heard me read it to them and were supportive about it. For R, my aunts, uncles, and cousins. This book is dedicated to all of you with love. Thanks to Nazareth college of rochester, NY, and all the staff and students that l knew; to rochester, NY, liverpool high school, syracuse, NY, the people at church watertown, NY, New York city and Rennes frances, and the friends l made there in 1993 – 1994. for 12 step groups everywhere such as Alanon for friends and family of alcoholics. God bless you all. Synopsis: How I suicided not is a story about the author's life and experiences, from birth until her early thirties. It tells about how she went from mostly happy childhood and young adulthood to depression, anxiety, and poverty, which did not help – her mother nearly died when the author was nine, and the 1979 swine shot was the culprit. 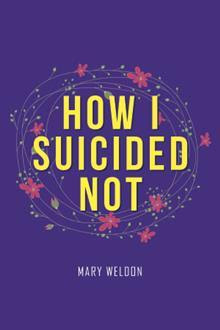 Mary Weldon put herself through college, got a scholarship, studied in france, and developed depression and a eating disorder. Ultimately, self help books and the local clinic as well as a few hospital stays helped her to choose life. Some relationships faltered and did not succeed, but she kept her chin up and kept her faith in god. Review: I found this book really easy to get in to and hard to put down once l started reading. I was hooked on this book after reading the first page I was sad to read that mary's mother nearly died after having the swine flu shot when mary was nine years old I am glad she survived. I was sad that Mary's mother and father split up when Mary and her sister was younger. The family that mary stay with when she was in france sounds like a great second family I was sad to finish reading this book. I was sad to read that mary lost family members on both her mother's side and her father's side. It did not take me long to finish reading this book. I can not put in to words how great this book really is l would tell people to read it for themselves to know how great this book really is. I like that Mary and her sister finished school and went to college. I love that Mary went travelling I was sad to read that a lady that Mary was staying with passed away it was nice of mary to go to her funeral. It was very sad to read that one of Mary' housemates mother passed away due to cancer. Mary was there for her housemate and went to her funeral. I would love to read more about Mary, her family and friends and her life. I was sad to read that Mary's mother passed away at the age of 70. Mary's father always sent his two beloved daughters money to help with stuff for school, college, clothes or food. I was sad to read that Mary tried to commit suicide twice I am glad she is still alive. I am in love with this book. I was sad Mary's now ex – boyfriend was stalking her. I was happy that Mary's mother got married again and l was happy Mary's sister finished college. I am happy that Mary found someone to look after her and they are engaged to each other. I hope Mary and her fiancee have children once they are married. This book is truly amazing I wish to read more from Mary Weldon. I was sad to read what happened to poet when he was younger. I was happy that Mary got a job but her ex – boyfriend and his girlfriend was there in the place where Mary was working. I am glad Mary hid so he could not see her. It was nice to read that Mary wrote that if poet's daughters wanted to know anything about their father or need help to contact her publishers and Mary would try to help them the best she could. I was sad to read that poet's daughter's mother passed away and his daughters where left with somebody that was not their father I think his daughters should have been given to their father. Poet sounds like a great father. He also sounds like he writes some great poetry. I wish I could read some of his poems. I really enjoyed reading this book. When l was reading this book I would put some essential oils in my humidifier and put the lights on and chill on my bed listening to magic or something on TV or netflix. About The Author: Mary Weldon lives in the northern part of New York where she has a cat and dog as well as a fiancee. She has been writing since she was 12 years old, when she wrote 300 pages of stories based on Greek mythology. Currently she is working on a sequel to this book, and after that a book about god for children, and next a retelling of the stories she wrote at 12 – 14 years of age mentioned above. God bless you and thanks for reading the books. About The Book: I really love this book and the colours on this bookcover are great and my favorite colour is used on the cover and the writing being in yellow and white makes it stand out more.